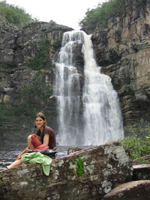 Cool two day trip to Parque Nacional da Chapada dos Veadeiros in the state of Goias, about three hours from Brasilia. On day 1 we did the Trilha dos Canions and on day 2 we did the slightly shorter but steeper Trilha dos Saltos. The second day we hiked with our guides (you have to have one) and Brasileiros Luciana and Joerg Wagner (yes, he is Brazilian) whom we ran into at the entrance. We hiked passed a couple of magnificent waterfalls and then eventually came to rapids where this pictures were taken. One particular feature was a hole, about 3m deep underneath a mini-waterfall. With a bit of maneuvering, one could lower ones' body into the hole and get a back message or even totally disappear underneath it. The water was luke warm and we stayed in these pools for about an hour, playing around and exploring the whole vicinity of this stretch of the river. Truly fascinating and well worth the trip.